Byron wrote this poem after meeting Mrs. Anne Beatrix Wilmot at a party. She was the wife of his cousin, and Byron was immediately struck with her beauty. "She Walks in Beauty" is the celebration of a woman's beauty inside and out. 1..What is beauty? To what extent does beauty depend on personality? 2...Was Byron declaring his love for the young woman or simply celebrating her beauty? 3...Write a poem about a quality—strength, generosity, kindness, beauty, charm, selflessness, etc. 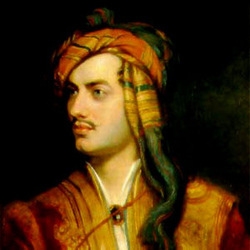 Don Juan (1819-24) is considered Byron's foremost achievement and one of English literature's great long poems. Variously described as a satire, epic, and novel in verse, the unfinished work defies critical categorization despite the consensus that it contains some of the sharpest social criticism in the English language. Writing in an animated style, Byron utilized a variety of narrative perspectives to comment on a wide range of concerns, including liberty, tyranny, war, love, sexuality, hypocrisy, and the mores of high society. The poet's ironic observations and brutally candid portrayal of human weaknesses garnered widespread condemnation from his contemporaries, who subjected Don Juan and its author to an unforgiving and almost relentless campaign of personal slander and critical abuse. 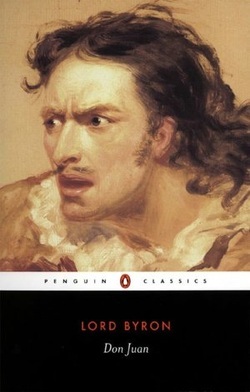 Today, however, critics regard Byron's complex, profoundly skeptical yet often humorous work as a remarkable anticipation of both the mood and thematic occupations of modern literature. ***Byron's hero [Don Juan] is, after all, only a vagabond libertine. And he is dumb: he does not discuss himself with a Sganarelle-Leporello or with the fathers or brothers of his mistresses: he does not even, like Casanova, tell his own story. In fact he is not a true Don Juan at all; for he is no more an enemy of God than any romantic and adventurous young sower of wild oats. ***Byron was as little of a philosopher as Peter the Great: both were instances of that rare and useful, but unedifying variation, an energetic genius born without the prejudices or superstitions of his contemporaries. The resultant unscrupulous freedom of thought made Byron a greater poet than Wordsworth just as it made Peter a greater king than George III; but as it was, after all, only a negative qualification, it did not prevent Peter from being an appalling blackguard and an arrant poltroon, nor did it enable Byron to become a religious force like Shelley. 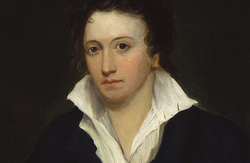 Shelley, born the heir to rich estates and the son of an Member of Parliament, went to University College, Oxford in 1810, but in March of the following year he and a friend, Thomas Jefferson Hogg, were both expelled for the suspected authorship of a pamphlet entitled The Necessity of Atheism. In 1811 he met and eloped to Edinburgh with Harriet Westbrook and, one year later, went with her and her older sister first to Dublin, then to Devon and North Wales, where they stayed for six months into 1813. However, by 1814, and with the birth of two children, their marriage had collapsed and Shelley eloped once again, this time with Mary Godwin. Along with Mary's step-sister, the couple travelled to France, Switzerland and Germany before returning to London where he took a house with Mary on the edge of Great Windsor Park and wrote Alastor (1816), the poem that first brought him fame. In 1816 Shelley spent the summer on Lake Geneva with Byron and Mary who had begun work on her Frankenstein. In the autumn of that year Harriet drowned herself in the Serpentine in Hyde Park and Shelley then married Mary and settled with her, in 1817, at Great Marlow, on the Thames. 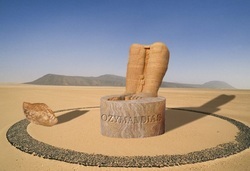 They later travelled to Italy, where Shelley wrote the sonnet Ozymandias (written 1818) and translated Plato's Symposium from the Greek. Shelley himself drowned in a sailing accident in 1822. So sweet, the sense faints picturing them! 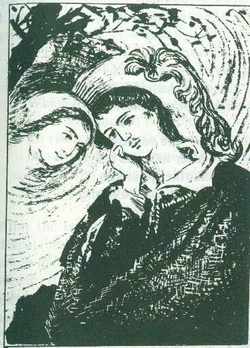 "La Belle Dame Sans Mercy"
"La Belle Dame Sans Mercy" is a literary Ballad. 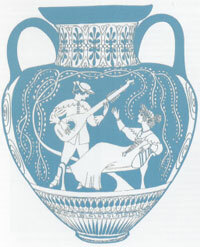 Keats did not invent the story line, instead his ballad begins at the previous ballad's end. The plot is from an old folk ballad that was centuries old, "True-Thomas." In "True-Thomas" a man was enchanted by the Queen of Elfland. She lured him to her home and where he had to serve her for seven years. 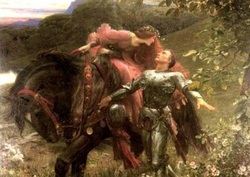 Keats' ballad begins after the man (knight) has finished his seven years of service. - Words like woebegone, sighed, gloam, alone the withering sedge, the cold, and the absence of the bird's song all reflect the somber and sorrowful mood of the knight. Keats calls the urn an “unravish’d bride of quietness” because it has existed for centuries without undergoing any changes (it is “unravished”) as it sits quietly on a shelf or table. He also calls it a “foster-child of silence and time” because it is has been adopted by silence and time, parents who have conferred on the urn eternal stillness. In addition, Keats refers to the urn as a “sylvan historian” because it records a pastoral scene from long ago. (“Sylvan” refers to anything pertaining to woods or forests.) This scene tells a story (“legend”) in pictures framed with leaves (“leaf-fring’d”)–a story that the urn tells more charmingly with its images than Keats does with his pen. Keats speculates that the scene is set either in Tempe or Arcady. Tempe is a valley in Thessaly, Greece–between Mount Olympus and Mount Ossa–that is favored by Apollo, the god of poetry and music. Arcady is Arcadia, a picturesque region in the Peloponnesus (a peninsula making up the southern part of Greece) where inhabitants live in carefree simplicity. Keats wonders whether the images he sees represent humans or gods. And, he asks, who are the reluctant (“loth”) maidens and what is the activity taking place? 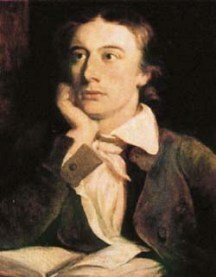 Using paradox and oxymoron to open Stanza 2, Keats praises the silent music coming from the pipes and timbrels as far more pleasing than the audible music of real life, for the music from the urn is for the spirit. Keats then notes that the young man playing the pipe beneath trees must always remain an etched figure on the urn. He is fixed in time like the leaves on the tree. They will remain ever green and never die. Keats also says the bold young lover (who may be the piper or another person) can never embrace the maiden next to him even though he is so close to her. However, Keats says, the young man should not grieve, for his lady love will remain beautiful forever, and their love–though unfulfilled–will continue through all eternity. Keats inquires about the images of people approaching an altar to sacrifice a "lowing" (mooing) cow, one that has never borne a calf, on a green altar. Do these simple folk come from a little town on a river, a seashore, or a mountain topped by a peaceful fortress. Wherever the town is, it will be forever empty, for all of its inhabitants are here participating in the festivities depicted on the urn. Like the other figures on the urn, townspeople are frozen in time; they cannot escape the urn and return to their homes. Keats begins by addressing the urn as an “attic shape.” Attic refers to Attica, a region of east-central ancient Greece in which Athens was the chief city. Shape, of course, refers to the urn. Thus, attic shape is an urn that was crafted in ancient Attica. The urn is a beautiful one, poet says, adorned with “brede” (braiding, embroidery) depicting marble men and women enacting a scene in the tangle of st tree branches and weeds. As people look upon the scene, they ponder it–as they would ponder eternity–trying so hard to grasp its meaning that they exhaust themselves of thought. Keats calls the scene a “cold pastoral!”–in part because it is made of cold, unchanging marble and in part, perhaps, because it frustrates him with its unfathomable mysteries, as does eternity. (At this time in his life, Keats was suffering from tuberculosis, a disease that had killed his brother, and was no doubt much occupied with thoughts of eternity. He was also passionately in love with a young woman, Fanny Brawne, but was unable to act decisively on his feelings–even though she reciprocated his love–because he believed his lower social status and his dubious financial situation stood in the way. Consequently, he was like the cold marble of the urn–fixed and immovable.) Keats says that when death claims him and all those of his generation, the urn will remain. And it will say to the next generation what it has said to Keats: “Beauty is truth, truth beauty.” In other words, do not try to look beyond the beauty of the urn and its images, which are representations of the eternal, for no one can see into eternity. The beauty itself is enough for a human; that is the only truth that a human can fully grasp. The poem ends with an endorsement of these words, saying they make up the only axiom that any human being really needs to know.